Thank you for this guide - it is very helpful! One question - Do you know the wire colors for tapping the blinkers under the center console? I've got the install 99% complete - just can't figure out which wires in the hazard switch to tap. you need two diodes here. how much is one of these 5704 with sensor n back up battery cost. Remove 2 10mm bolt holding the fuse box, and then splice behind the fuse box with (Remote Start, 10-pin havy gauge connector). This is the hardest part to cut and solder out of the whole installation! Chassis Ground use spade connector here and connect the Black wire to the grounding point located next to the Keyless Module (shown in the picture). It is secured by 10mm bolt, loosen it and jam in the the spade connector and tighten it. Fish the wire through the black Keyless Module housing cover. Solder the (Door Lock, 3-pin Connector) on the Keyless Module PCB like in the picture. Then cut a small opening to allow the wires to fit through. Slide the PCB back into the housing. 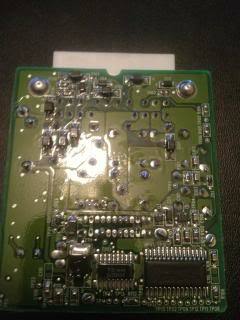 Replace Keyless Module housing cover. i was wondering what is additional to add the remote start function to the alarm.. i am trying the viper 5704 with remote start in my s2k and wondering what alse needs to be done to add this function.. also wondering cant you tap into wires vs. soldering directly to the circuit board? I somewhat understand those wirings but I want to know if you guys installed the hood sensor. Also as for the relay, do I just buy 5 pin relay and hook up the wires? Okay I tried to save few hundred bucks and tried to gain some experience with this. I am not stuck with battery back up wires and my all other wires. I may haven't been searching enough but I don't know how to connect my battery backup wires with my alarm wires. There arent wires to tap into, you either jam new wires into the Keyless Module plug or solder on to the PCB directly. A bit late, but here is the diagram with backup battery on how to hook it up. As far as the relay, check it with the link above on how to connect it. With the backup battery, according to the pinout on the alarm itself, H2/19 is both trunk pin and instant trigger so if you wire the blue wire from the backup battery to H2/19 it should be right. 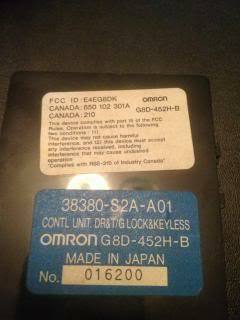 For the keyless module. mine is slightly a little different from yours. do u know exactly what point neededs to be solder for unlock and lock?